All conference workshops will be held at the University of Illinois at Chicago in the Student Center East (SCE) building. The University of Illinois at Chicago boasts one of the Midwest’s largest AAPI student populations and is the only federally-recognized Asian American and Native American Pacific Islander-Serving Institution (AANAPISI) in the Midwest. UIC is served by the CTA (the “El”) Blue Line train (UIC-Halsted and Racine stops) connecting the campus with downtown, O’Hare International Airport, northwest and west side neighborhoods of Chicago, and the western suburbs of Oak Park, Forest Park, and Cicero. A block of rooms have been reserved at the Crowne Plaza in the fanciful neighborhood of Greektown, just 5 blocks from the conference site. Reservations must be made by July 6 to secure the special rate of $139/night. Saturday, April 21, 2012 at 7 p.m.
Come meet the NQAPIA Co-Directors and National Board Members when we are in Chicago to plan and strategize for our upcoming year! – Find out more about our 2012 National Conference in Washington, DC! Getting there: Blue Line to UIC-Halsted, #126 Jackson and #8 Halsted buses. Metered street parking available. 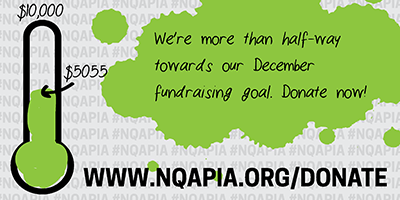 Funds raised will support scholarships for our upcoming National Conference in July. Friends, family and allies welcome! -We have a private party room with gender-neutral restrooms. Want to RSVP and donate ahead of time by credit card? Want to RSVP, but pay at the door? That’s cool- email Joy at joy.messinger@gmail.com. This networking reception recognizes the diversity within the LGBT and AAPI communities and also provides support to LGBT attorneys in corporate, commercial, government, and public interest practice. Welcoming Remarks by U.S. District Court Judge Edmond Chang. Keynote Address by Peter S. Ohr, Regional Director of the National Labor Relations Board. Event is free but donated proceeds will support scholarships for student to attend the National Queer Asian Pacific Islander Alliance conference in Washington, DC in July 2012.